Flight controls system are designed to control the aircraft in all three-axis safely. At early days mechanical linkages were used, later hydro mechanical was used and now combination of mechanical, hydro-mechanical, and electrons are used to control the flight control surfaces. 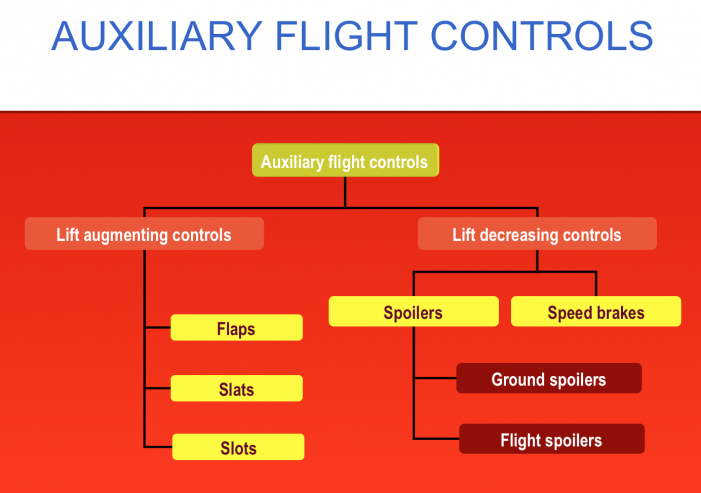 Aircraft flight control system consists of primary, secondary and auxiliary controls that are used to control the aircraft with optimum efficiency. Ailerons, Elevator and Rudder are categorized as primary controls, trim tabs and spring tabs are categorized as secondary controls and flaps, slot, and spoilers are categorized as auxiliary controls. Primary controls; Ailerons control the rolling moment, Elevators control the pitching moment and the Rudder controls the yawing moment of an aircraft. Auxiliary controls; flaps, spoilers and slot are used as lift augmenting or destroying controls.